Sholazar Basin (pronounced SHOL-uh-zarh) is a tropical jungle basin in the midst of Northrend. 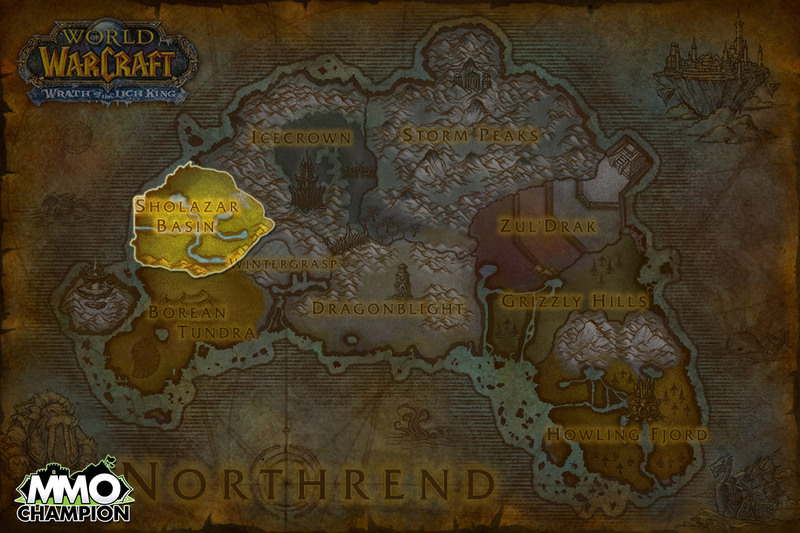 It is found between Borean Tundra and Icecrown Glacier. The zone's climate and safety from the Scourge is maintained by pylons, erected by the Titans. Recently, one pylon in the east has fallen and the Scourge has taken this opportunity to invade from Icecrown to the north. They are now streaming down The Avalanche. In Sholazar Basin, players will take part in a faction war between the wolvar (Frenzyheart Tribe) and the gorlocs (arctic cousins of murlocs). The various gorloc tribes have gathered together to form the group called the Oracles. Players are only able to choose one side, but are allowed to easily change to which faction they wish to be allied with. Sholazar Basin is home to several characters of note. At Frenzyheart Hill, High-Shaman Rakjak leads the Frenzyheart Tribe in the fight against local fauna and their hated enemies, the Oracles, led by High-Oracle Soo-say. The wolvar are not the only new arrivals to the basin, as Hemet Nesingwary leads his band of hunters in search of new game, targeting Broodmother Slivina as the ultimate challenge to a hunter. Artruis the Heartless leads the Scourge attack on the region, but is continually held at bay by the mysterious Avatar of Freya. 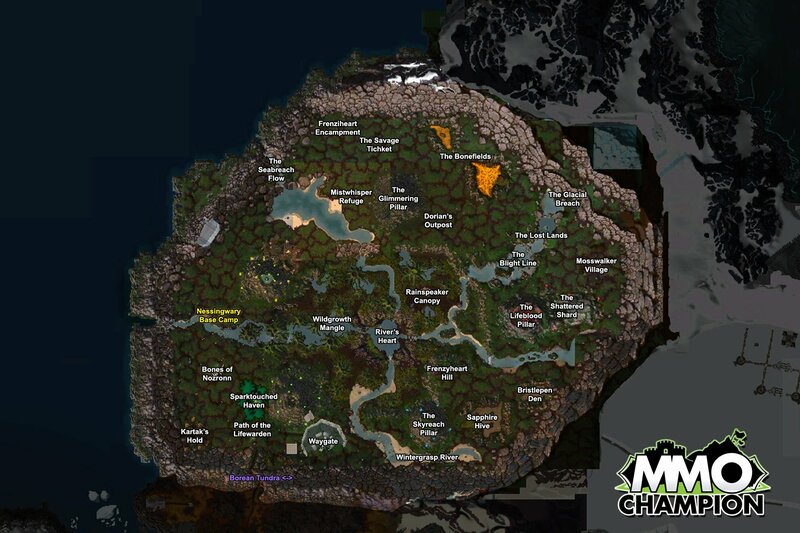 See the Sholazar Basin quests. Many fearsome and exotic beasts dwell in the steamy jungle of Sholazar Basin. Goretalon rocs glide through the Basin and Sapphire Hive wasps buzz and go about the business of protecting their hive. The gigantic and bad-tempered shardhorn rhinos graze while hardknuckle gorillas forage nearby. Sinuous emperor cobras and massive dreadsabers stalk their prey through the undergrowth, both of which are deadly apex predators and more than a match for an unwary traveler in the Basin. Mangal crocolisks also make their home in the Basin's waters and should be treated with caution as well. The towering green devilsaur King Krush. The poisonous emperor cobra Venomtip. The incredibly elusive and beautiful mate of Harkoa herself, the spirit beast Loque'nahak. The fiercely protective protodragon Broodmother Slivina. Aotona found in Wildgrowth Mangal. Sholazar Basin is the home of both the Oracles and the Frenzyheart Tribe. Both are constantly at war with eachother, and players will choose to align with one faction at a time through one of the main quest chains of the area. Players can switch their chosen faction by repeating the last quest in the starting chain and killing/saving the character of the opposite faction (A Hero's Burden). Sholazar Basin also has its own hidden reputation, which is currently unused, that will increase as faction dailies are completed, and will not decrease if a player decides to switch factions. In Lands of Mystery, this area was treated more as a subzone of the Borean Tundra. To open up the flight path at Nesingwary Base Camp, there is a 2-part quest chain from Weslex Quickwrench that you have to complete first. Given Blizzard's fondness for pop-culture references, Sholazar may be a nod to the Savage Land of Marvel Comics. Both are tropical paradises formed in Arctic regions by a powerful race of creator-beings. At co-ordinates (38,37), a hatch with the numbers 5 9 16 17 24 43 can be found as a reference to the series Lost. The naming of subzone The Lost Lands is a reference to Land of the Lost, which both Sholazar Basin and Un'Goro Crater are based on. The four crystals from Un'Goro make a comeback, and their roles are further solidified. The Red crystals of the Lifeblood Pillar stick to their protective roots ([Crystal Ward]), preventing the Scourge from entering Sholazar. The Green crystals (Previous example: [Crystal Force]) of the Mosslight are used to empower the Oracles as they attack Kartak's Hold. The Yellow crystals, ([Crystal Spire] [Crystal Restore]) dealing mostly with quantity back in Un'Goro, are sought after to create a fortune by the Venture Company at the Suntouched Pillar. The Blue crystals, ([Crystal Spire]) with the power to focus energy externally, are used by the Frenzyheart as they prepare to disrupt the Oracle shrines. Additionally, a new, white crystal is present at the Glimmering Pillar. As the crystals had no purpose previously, yet are used by Freya's Avatar as a force of destruction, it can be assumed this is infact their purpose.